A Gentle Reminder: Take Your ETS - Perelandra Ltd.
We hate having to post this reminder today. We're also grateful for ETS to help us through challenging times. There are heartbreaking, cruel, atrocious things happening every damn day. Yesterday, children in Nigeria were attending school as usual, and the 3-story building collapsed around and on them. Last week tornadoes ripped apart a small town in the U.S.
Today in New Zealand, as two communities of Muslims gathered together to pray, they were attacked and murdered. And this time, instead of learning about it through the filter of a news report, technology made it possible for people to see it live. That's not a bell we can unring. moving forward as you process what's happening. We have observed over many years that even people who know about and use ETS regularly tend to forget to take it during a crisis, exactly the time you need it most. It's difficult for us to choose when to remind you to take ETS. (Should we say it for this event, when we didn't mention the one two weeks ago, just as horrific?) And we know if we over-remind, it becomes easy to tune out the message. Unfortunately, so many tragic events are happening in the world, it would be irresponsible of us not to remind you to take your ETS when needed. So, we have thought of a way to simply say to you, as often as needed, "This is a time to take your ETS." 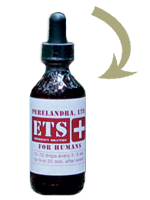 When we learn of large scale tragedies, in the U.S. and internationally, we will post a small bottle of ETS for Humans to the top right corner of our website, and post a photo of it on Facebook to remind you: Take ETS now. That's the signal: A picture of ETS for Humans that's linked to this message on our website. This is to get you into the habit of automatically reaching for ETS anytime you receive news that shocks and hurts you. It's hard to think straight at those times, so it has to be a habit that requires no thought. Any time you witness, hear or read about an event on this scale, take your ETS. If you're in the path of Hurricane Michael in the Gulf Coast, start taking your ETS now. And put enough ETS for your whole family and pets in your go bag in case of evacuation. Learn more here. If you're still reeling from the last two weeks of judicial hearings, testimony or the results, take ETS for Humans 2-3 times daily until it's no longer driving you to distraction. If watching the hearing and the news surrounding it brought up past trauma for you, take ETS for Humans 3-5 times daily. See the information on addressing "Extreme Trauma Events" here. If you're in the path of Hurricane Florence, start taking your ETS now. As we all try to deal with the news of another gut-wrenching, deadly mass shooting at another high school in America, this time in Santa Fe, Texas — Take ETS. If you're in Hawaii, or have friends and family that are impacted by the erupting volcano and earthquake — Take your ETS. If you're in the path of the latest nor'easter, it's time to take your ETS. For many, this was an eventful and stressful week, culminating today in the early-morning airstrikes on Syria. It's time to take your ETS. It's been three days since news first broke of the horrible mass shooting of children and teachers at a school in Florida. Another once unfathomable tragedy has shocked and saddened us all.